The Self Employed Women’s Association (SEWA) is a non-government (NGO) entity and trade union based in Ahmedabad dedicated to empowering women who are in the unorganized employment sector. Founded in 1972, they cater to 94% of women workers in India who are self-employed or working in their own small enterprise without any benefits. The organization’s main aim is to give a better life and bargaining power to these women. 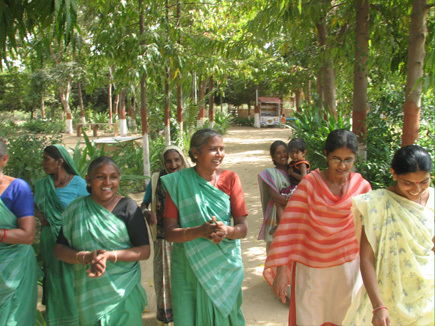 SEWA is both an organization and a movement to boost women’s rights to lucrative work, decision making and protection. -The SEWA Academy along with their other training centers focus on practical knowledge and training for members. This includes encouraging members to develop their confidence, talent and leadership potential. -SEWA also runs child care centers in cooperation with local groups, the social Welfare Board and ICDS. They take in children of agricultural, tobacco and other rural workers. - The program objectives are health education, as well as coordination with national health services (government, public hospitals and others) to help members with proper nutrition, family planning, immunization, and TB control, among others. - Hoping to improve housing/infrastructure environments for poor women, SEWA offers access to home financing, legal services, technical and practical information about housing markets and housing-related income opportunities. - The organization provides legal assistance through an advisory center and court support in member’s cases (complaints, harassment, work related and others). - The Swashrayi Mahila Sewa Sahakari Bank (SEWA Bank) is a cooperative that provides financial services to members. It offers appropriate credit and asset building services to help poor, self-employed women better their financial situations. SEWA Ecotourism (Ganeshpura) is initiated by SEWA’s Vanlaxmi Women Tree Grower’s Cooperative to achieve an eco-regenerative project in Gujarat. Aimed at creating sustainable self-employment, the women perform permaculture activities through multi-cropping and create tourism opportunities on the farm site. SEWA ecotourism needs more technical assistance for making their farm more sustainable. Visitors can also help fundraising efforts. Grants are appreciated as well. Bhadra, Ahmedabad – 380 001. This entry was posted on Friday, May 28th, 2010 at 10:15 am	and is filed under India projects, Volunteer Opportunities. You can follow any responses to this entry through the RSS 2.0 feed. You can leave a response, or trackback from your own site. Ooohh, Yes, i also really like to visit new place,your idea is good. Hey, Thanks for posting! I really enjoyed the report. I’ve already bookmark this article.